This perfect Utility Wagon is certainly your good choice！Durable steel frame can ensure it can be used time and time 4 oversized large pneumatic rubber wheels make this wagon more stable. To facilitate loading and unloading of heavy items from the wagon, the sides of the crate fold down.To move heavier objects, by removing the foldable sides with the quick release hinges.Great for gardens, warehouses, construction sites and much more!. Crate sides fold down or remove for flatbed use with oversized loads,suitable for flatbed use with oversized loads. 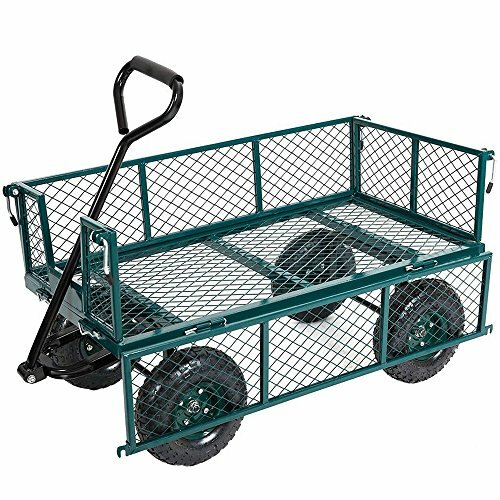 Four oversized wheels and handle make the cart perfect for hauling plants, rocks and other supplies. New frame design allows for quick and easy assembly while offering improved maneuverability and rigidity. Rubber tires are pneumatic.Check stability regularly. Screws may loosen and need to be tightened. Steel mesh crate with powder-coated finish for durability and corrosion resistance.